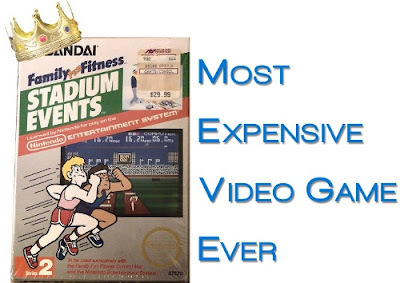 Stadium Events has officially taken the crown as the most expensive video game ever sold. 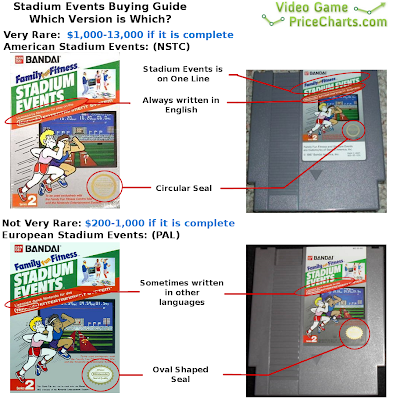 A sealed copy of the NTSC version of Stadium Events sold on ebay for $41,300! This is more expensive than Nintendo Campus Challenge which sold for $20,100 or Nintendo World Championships Gold which sold for $21,400. The two previous record prices. The seller of the game lives in Olathe, Kansas and had purchased the game brand new at a Richmond Gordmans, a department store in the midwest, for $29.99. They never opened it after they realized it needed a power pad to play. They never got around to returning it either (maybe the smartest decision they ever made). The seller had a total return of 137,568% or 37.9% per year on this "mistaken" Stadium Events purchase. That's a better return than Apple, Microsoft, or almost any other investment you could make at the same time. Earlier we posted about a sealed Stadium Events on ebay, it is going for $39,900 right now. This auction has received tons of publicity and been written about it hundreds of video game blogs because it is new. The auction title states specifically that it is "Sealed" & "New" and even uses a sub headline to say a second time that it is sealed. Six letters S-E-A-L-E-D might be worth $32,000. There is another Sealed Stadium Events that is on ebay right now too but hasn't gotten as much publicity. The listing doesn't say "New" or "Sealed" in the title but the pictures all show it is new and the description says its new too. AND it is the NTSC version. I'm sure bidding will increase on this second auction too but I bet it will end lower than the first one because it doesn't advertise what it is. I almost feel bad for the seller. Nintendo had a Media Summit today to announce their release schedule for the first half of 2010. Nintendo is one of the top publishers when it comes to their games maintaining resale value. Nintendo also announced a new piece of hardware in the Nintendo DSi XL. It will be priced at $189.99 and feature screens that are 93% larger than the DS Lite. Though this is hardly new considering it's been out in Japan for a few months, it's nice to know when it's coming to North America. Sega is releasing a mature games bundle for Australian Wii's. It's called "Welcome to Violence" and includes "The Conduit", "House of the Dead Overkill", and "MadWorld". The price is right too. Only $110 Australian dollars which is about what a new Xbox 360 or PS3 game costs in the land down under. I played all three of these games when they released stateside but any Australian readers out there should definitely pick this up if they haven't tried these games yet. If Sega does release this in the US I might be tempted to buy it because of the cool name and box art. Plus bundles make great collectibles. 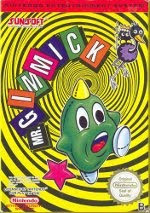 We recently added a small selection of PC games and Mac games to our site (about 200 games for each). We can work on adding more but there are tens of thousands of PC and Mac games which is no small task to add them all. We will do it if our users are interested, but will spend the time adding other features instead if there isn't much interest. Leave a comment below letting us know if you are interested in the PC and Mac game sections and if we should add more games to the list. When it comes to getting gamers excited for a new game in a series, there is no company better than Bungie. Their Halo games seem to set new sales records with every new release and they tend to keep their value and popularity quite well. The next Halo game, Halo Reach, is set to release this upcoming holiday season with promises of new characters, levels, enemies and weapons. Before then, Microsoft plans on releasing a multiplayer beta for the game on May 3. The catch, you’ve gotta have a copy of Halo 3 ODST to be enlisted in the beta. So what does this mean exactly? We should see the resale price of Halo 3 ODST increase leading into May. We’ll have to check in on ODST in a few months to see if we were right. 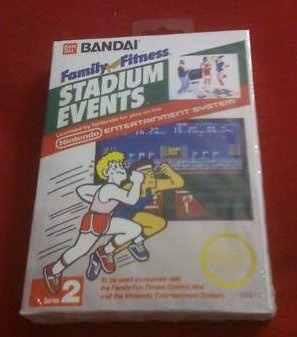 There is a factory sealed NTSC version of Stadium Events on ebay right now. The bidding is already at $10,000 and with the recent Stadium Events hysteria going around the auction will probably close much higher. Let's watch the madness continue. At least it isn't people paying $5,600+ for a PAL Stadium Events. That is true madness when it was selling for about $1,000 less than a year ago. 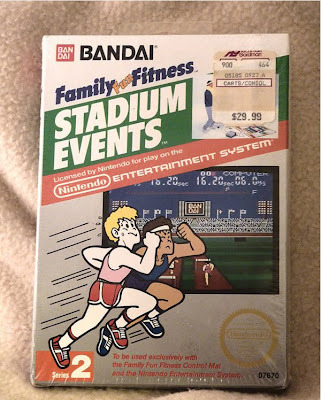 There are tons of stadium events auctions on ebay after an auction for Stadium Events and 4 other NES games sold for $13,105. Many of these auctions are for a game that is not that rare! There is a NTSC Stadium Events which was released in the USA and quickly discontinued and is the more expensive version. 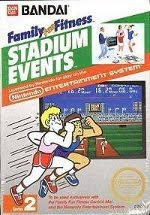 There is a PAL Stadium Events too, which was released in Europe and is not as rare or expensive. Below is a buying guide so you know how to tell which Stadium Events version is which and don't get ripped off. The NTSC Stadium Events is the more valuable and more rare version of the game. It sells for anywhere from $1,000 for just the game and $13,000 for the complete game with the box and instructions. Here's how you tell if the game is NTSC. 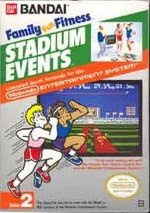 The PAL Stadium Events is still a fairly rare game and pretty expensive too, but not compared to the NTSC Stadium Events. The PAL version sells for about $100 for the cartridge only to about $1,000 with the box and instructions. Amazon is doing a sale on Wii games today only, February 16th. It is part of their Gold Box promotion where every couple of hours a new item goes on sale. Right now Walk It Out is 33% off (I know, not a favorite game among VGPC readers). But earlier in the day Beatles Rock Band was on sale and there are seven more sale Wii games through-out the day. Hopefully they will have some really good sales later in the day, I'm keeping my fingers crossed for a sale on Tatsunoko vs. Capcom: Ultimate All-Stars. Please Amazon! The Atari 2600 was the first ultra successful home video game console. It is the console that started gaming for many people. During its life-cycle the Atari 2600 had thousands of games released. Some of them were good and some were horrible. Most are ridiculously cheap but a few 2600 games have become rare collectibles. The list below is the most rare and expensive Atari 2600 games. Air Raid is the only known game released by Men-A-Vision and has a very distinctive cartridge design with a blue 'T' shaped handle. In the game you must protect a city from invading alien ships. You try to destroy them before they destroy the city. Air Raid is believed to be the rarest of the commercially released games for the Atari 2600. 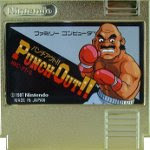 The cartridge by itself usually sells for $3,000. Only two copies are known to exist with the original box. One of them sold for $31,600 in April 2010 and the other for $14,000 in 2012. There is only one known complete version with the manual too. 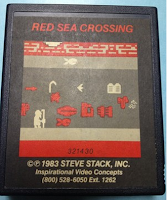 Red Sea Crossing wasn't even known in the Atari community until 2007 when it was found at a garage sale. It is a Christian game and was only sold via phone order. The only known ad for the game was in Christianity Today. Red Sea Crossing is the most expensive Atari 2600 game when it is cartridge only, by about $10,000. Air Raid sells for more when it comes with a box. 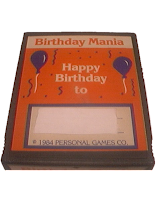 Personal Games created Birthday Mania as a custom birthday gift for Atari owners. The buyer would custom order the game with the recipient's name on the title screen and a space on the label to write their name. The concept never gained traction. Because the items had to be special ordered and were not mass-produced, the game is very rare. Only two copies are known to exist. This game has never been sold publicly so the price is an estimate but the highest known offer to buy was $6,500. Gamma Attack was the only game released by Gammation. It's rarity rivals that of Air Raid with only two known copies in existence. You control a Gamma ship and must destroy enemies as they enter your planet. The game has never sold at a public auction so the exact price is hard to know. The price listed is based upon offers that one of the owner's claims he has received. It is a very reasonable estimate considering the game's rarity. Karate for Atari 2600 was released by two companies, Froggo and Ultravision. The Froggo version is quite common and sells for hardly anything. The Ultravision version is very rare and sells for top dollar. 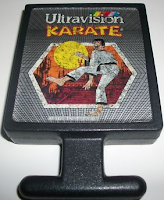 Ultravision has two versions of Karate, a T-shape cartridge (pictured to the left) and a standard shaped cartridge. Both have the same artwork on the front and sell for roughly the same amount. 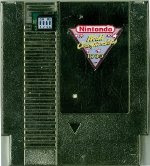 Pepsi Invaders was a custom designed game for Coca-Cola. They took the Space Invaders game concept and changed the aliens to letters spelling "Pepsi". 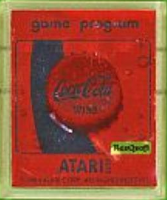 The game was given to executives at a sales convention in 1983. Only 125 were originally produced. Based upon the number of sales for this game it is assumed that the vast majority were destroyed by the recipients. 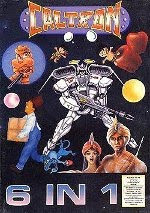 Mangia was developed by Spectravision and like most Spectravision games it was only available via mail order. The mail order distribution method made all their games much harder to find than ones available at retail stores. Mangia is the rarest of their games. In Mangia you control a boy who eats pasta until his stomach explodes. To avoid dying you throw pasta to a dog or cat, but must avoid your mom seeing you waste food. 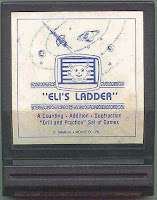 Eli's Ladder is an educational game for the Atari 2600. You count and do addition and subtraction games and drills. 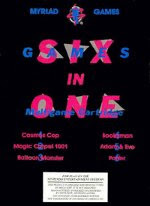 The game was released by SimAge. The game was originally packaged with a wall chart and motivational stickers to help motivate kids to learn and play. These are even more difficult to find than the game. The game Shark Attack was originally released with the name Lochjaw. Apollo decided to change the name after they were sued for infringing on the copyrights for Jaws the movie. Because the game was only released for a limited time with this name and cover art it is very hard to find today. The game play is almost the exact same as Shark Attack. You try to collect diamonds in each level before a sharks eats you and before he eats too many of the diamonds too. Gauntlet is another mail-order only game for the Atari 2600. This one was released by Answer Software. It has nothing in common with the dungeon crawling game with the same name. 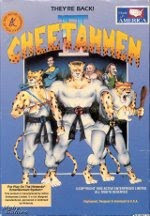 In this game you must prove your manhood to an ancient Indian tribe by running through their gauntlet of obstacles. The game was originally sold in a foam case with no box so this game is never found with a "box" like most games. Atlantis II is a special edition of the original Atlantis that was only given to a few gamers as part of a contest. The developers held a national contest to crown the best Atlantis player. 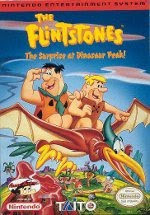 Numerous people reached the maximum score in the game so in order to crown a champion they mailed entries with the maximum score a new version of Atlantis that is much faster. The exterior of both Atlantis games looks the exact same. The easiest way to tell the difference is by looking at the font on the high score. In order to know which version a newly submitted high score came from the developer changed the font. 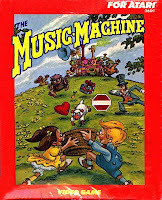 The Music Machine is a Christian video game based upon a series of products with the same name including, CD's, coloring books, and movies. You play as two children who must collect the Fruits of the Spirit - love, kindness, self-control, patience, etc - as they fall down the screen. The game was only sold through Christian bookstores. Its limited distribution makes the game very rare today. River Patrol is based upon the arcade game with the same name. You must navigate a boat down a river while avoiding obstacles. The exact reason for the game's rarity is unknown, but is more than likely due to the game releasing after the great video game crash in 1984. After this point, Atari plummeted in popularity and games for the console sold very poorly. The Atari re-release is the expensive version. You can tell which version you have by looking at the cover art. If the cover art on the game matches the cover art on the box at left, you have the rare version. Out of Control is a spaceship flying game released by Avalon Hill. You control a spaceship that must fly through buoys, pops balloons, and then land in a space station. 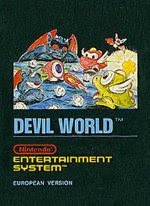 This is another game that was the victim of the video game crash in 1983. Publishers severely limited their production after the crash to make sure they didn't waste money on cartridges that wouldn't sell. Instead of selling cartridges with a permanent game inside, Xante decided to make re-writable cartridges. They setup kiosk where you could return your games to have them rewritten as another title. They even printed a plain white label for you with the name of the new game. The Xante games are Alien, Beany Bopper, Crypts of Chaos, Demon Attack, No Escape, and Solar Storm. All six games are extremely rare. The cartridges below are not games in the sense that you play them. They are most of utilities for the Atari. All the non-games work in the Atari 2600 and they are all very rare. Video Life was an Atari program with Conway's Game of Life built in. You created an initial state of "life" - a series of dots - and then watched as they took on a life of their own. 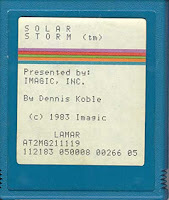 The game only worked if you already owned the rare MagiCard programming tool (see below). This severely limited production and sales of the game. 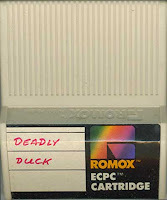 Similar to Xante games, the ECPC cartridges are re-programmable cartridges but they all started off blank. You would buy the cartridge and bring it to any ROMOX software center and choose a game from their selections. 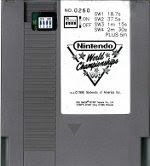 Another blank cartridge that allowed you to change the game on the cartridge. This time you need a hardware called a "Duplicator" in order to transfer a game. 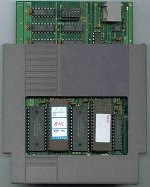 The game with the Duplicator is extremely rare, but without it the cartridge could just be a collector's piece if a game was never transferred onto it. The Color Bar Generator does exactly what it's name implies. It would create 15 different color bar patterns to diagnose TV color or alignment problems. The item was sold so consumers to diagnose problems themselves without needing a technician. One of the patterns was designed to test the color producing circuits on the Atari system. MagiCard is a programming tool released by CommaVid. The cartridge came with a 100+ page instruction booklet and sample programs explaining how to use the software. The software was only available via mail-order and only worked with the keyboard accessory for the 2600.